Our Hill Country visit with Matt and Sherry began a week before we left Brazoria when they text us to let us know they found free overnight parking for us for the two nights we planned to visit with them. They noticed during their travels that Messina-Hof winery located right on Hwy 290 had RVs in their parking lot overnight. Matt and Sherry contact the winery and discover that the owners are totally OK with us parking there free of charge. Of course we feel like the least we could do was show up for half price glasses of wine at Happy Hour each day that we are there and never let it be said that we don’t do the least we can. Great job Matt and Sherry for finding us the perfect spot! 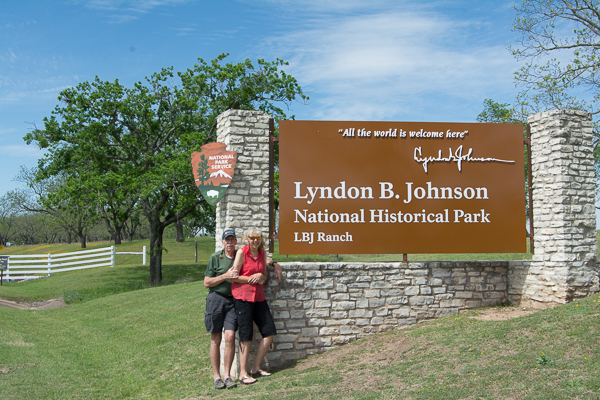 As soon as we get the rig parked, Matt and Sherry whisk us off for a very special tour of the Lyndon B Johnson National Historic Park where the two of them are volunteering as guides this Spring. With Matt as our official guide (and Sherry as our unofficial guide), we learn about the runway on the ranch, Lady Bird’s telecom investments and we enjoy a fact filled tour of the Texas White House. 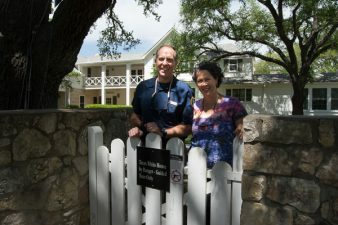 If you are in the hill country, a visit to this serene park is a worthwhile investment of an afternoon even if you are not lucky enough to get Matt or Sherry as your tour guide. After we leave the ranch, the next day and a half are a whirlwind tour of the magnificent blooming wildflowers carpeting this area and the many famed local attractions. I pay my first visit to Luckenbach which I love! 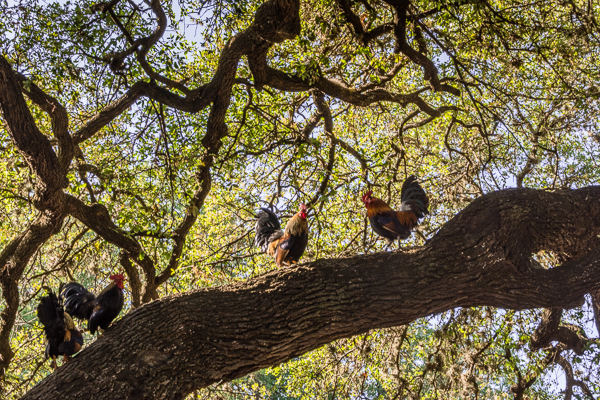 I feel as though I am there among the spirits of country music greats as we listen to a local trio perform for a small crowd below the chickens roosting in the shade of the live oaks above us. We make a couple of stops in Fredericksburg (one of my favorite Hill Country towns – so much to see and do there) including an evening visit for supper at Hondos. The country trio there features a steel guitar and we hate to leave before the last note fades, but tomorrow we need to head farther west so we shake hands with the band and end our visit with Matt and Sherry promising to hook up again very soon. Had a great time seeing you two! We feel like such celebrities being included in your blog! You both are celebrities to us!